First Application/Fouled Unit: Pour 4 oz. (1/2 cup) of Pro-Res Care per cu. ft. directly into brine well (for softeners with no brine well, pour directly into salt tank when salt is low). Manually regenerate softener. Repeat regeneration if taste, odor, or discoloration is detected in discharge, then run cold soft water tap nearest the softener until the odor or taste is gone. Regular Use: Add 1/2 oz. (1 Tbsp.) per cu. ft. to brine well before each regeneration. Automatic Feeder Systems: Follow recommended dosage and feed rates specified by manufacturer or supplier. Prevents iron and mineral build-up on integral parts of the softener. Removes iron and aluminum fouling that causes lost capacity and a decrease in performance. A non-ionic surfactant is added to aid in the cleaning of oil fouled resin. A liquid Phosphoric Acid mixture. 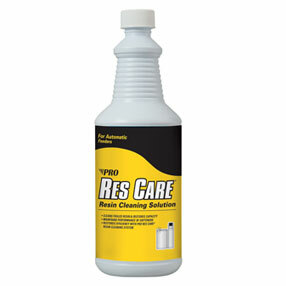 Pro-Res Care is not to be used with Gel Zeolite materials. Store in unopened containers under cool, dry conditions. Do not store with or close to strong bases. Read relevant Material Safety Data Sheet before handling product.